As you might imagine, I really love to wander around the grocery store. Lookee what I found today: Goldfish S’mores. I didn’t buy them, but they seem like they could be delicious. Not sure how I feel about a marshmallow flavored cookie/cracker (and it’s hard for me to separate Goldfish from the idea of cheddar-y-ness), but whatever. You stack it up! 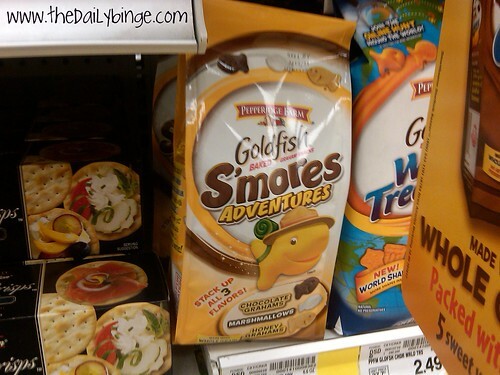 It’s definitely not the weirdest flavor that Goldfish has to offer these days. They also have pizza flavored stackers. And… neon. That’s not a flavor. Not that s’more flavored non-s’mores are a totally new thing. I think PopTarts has been on this train since the 1990s. I have been eating a lot of food lately (as I do), and taking pictures of funny foodstuffs that I am not necessarily eating (as I also do), but I haven’t had time to Binge-ify and post those pictures yet. Hopefully they’ll get up here… eventually. A few things to look forward to (if you care): My first visit to Magnolia Bakery, some pumpkin things (PUMPKIN SEASON IS HERE! ), and random vending machine grossness (courtesy of my workplace). Among many many other things. Some events might just live on the Flickr for a while. Because I’m a busy gal. Places to go, people to see, foods to eat! And if you see s’more hilarity (get it?) in your local wherever-you-are, send me a picture. Previous Previous post: THE VAMPIRE DIARIES Returns Tonight! Next Next post: It’s the Most Wonderful Time of the Year… PUMPKIN SEASON!